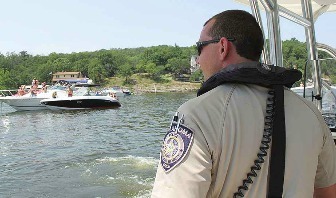 GRDA Police are encouraging everyone to have a safe Memorial Day Weekend boating on Grand and Hudson lakes. For many lake enthusiasts, Memorial Day weekend is just the beginning of many summer hours that will be spent on Oklahoma’s water playgrounds. Certainly, GRDA’s Grand and Hudson lakes in Northeast Oklahoma will welcome their share of visitors, as large crowds are expected to hit the water for boating, swimming, skiing, tubing, cruising or simply relaxing along the shore. With that in mind, the Grand River Dam Authority Police Department wants to remind all those lake visitors that “boating safe, boating smart and boating sober” is still the best way to spend time on the water. Before you leave the dock, know the stability, load capability and handling of the vessel you are operating. Remember, every boat is different. All boats must be equipped with certain safety equipment, but this equipment is useless if you don’t know how to use it. Learn how to properly use all the safety equipment on your boat. Check the water conditions and know where hazards like sandbars and stump beds are located. Before you leave the dock, check the weather conditions. Don’t get caught on the lake in a storm you could have avoided. Airplane pilots file a flight plan. Boaters need a float plan. Tell someone responsible where you are going and when you expect to return. Don’t drink and boat! Most lake accidents are alcohol related. Don’t become a statistic. Finally, if you need immediate assistance, the GRDA Police recommends you call 911. However, if you are on the boat with no cell phone access, you can use Marine Band 16 to radio for help. GRDA officers are gearing up for another great summer on Grand and Hudson lakes and will be out on the waters to promote safe outings, assist boaters and enforce lake rules and regulations. For more information on the department and lake safety, or for information on how an officer can assist you, contact the department at (918) 256 0911 or visit us online at grda.com. For more information on the lakes area, water safety or GRDA’s lake-related permits, you can also stop by the GRDA Ecosystems and Education Center in Langley. From Memorial Day to Labor Day, the building will be open 9AM to 4PM, seven days a week. At other times of the year, it is open 8AM to 4:30PM, Monday-Friday. NextThis Weekend at Grand Lake: Memorial Day Weekend 2015!